When are you your most beautiful? For me it is right after I get out of the shower and I have just let my wet hair out of my towel. My hair may or may not have gel in it yet, but it is me and only me. I guess you could say this is for me is the instance that all those country songs are always talking about when they tell you to "girl, let your hair down." For the first time all day, I am not trying to please anyone and I feel the most beautiful and young that I have all day. When do you let your hair down? When you get home from work, or snuggled up in front of the tv in the evenings? For me, I would have to say that letting my hair down is something that I am having to learn myself. Ironically, my hair is almost always down, but I feel like letting your hair down means so much more than just a pony tail holder. For me, it means my comfort zone, free and easy, and no inhibitions. Letting my hair down is one way that I am Living the Journey, and one way that I am challenging myself this year. I am learning to be more comfortable in my skin and knowing I am all I need, and that my beauty is always with me. 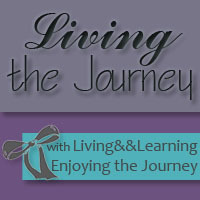 How are you Living your Journey this week? I hope you will link up with us below and share this week!! I love this!! i think I am when I am the happiest and just feel free! This was pretty thought-provoking! I'm not sure I have a quick answer for that! Maybe it's when I'm at the thrift......zoned in on finding goodies. Or by the mister on the sofa watching Amazing Race. Definitely a great question to mull over.